FIA Members receive 50% off all coffee drinks Monday through Friday, between 9:00a and 11:00a. 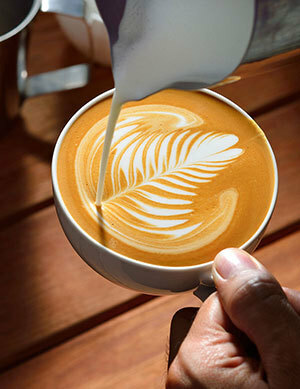 Enjoy an espresso drink featuring world class Illy coffee and our freshly baked goods! The Palette Café also offers delicious seasonal salads, sandwiches, pizzas, and soups along with its monthly specials. Follow us on Facebook and Instagram for all our specials. Located inside the North entrance of the Museum, the Palette Café offers signature sandwiches, salads, soups, desserts and a full bar. Begin your visit with a tasty treat, or take a break from the galleries for a glass of wine or a gourmet coffee. Featuring weekly food specials and dinner and cocktail events, there’s something new to experience with every visit.